This is the documentary I’ve been working on with East Van buddies Evan Crowe (@EvanCrowe) and Candice Vallantin (@VallantinC). After a lot of hard work, we’re proud to finally send it out into the world. The film is about Montreal-based lute virtuoso Matt Wadsworth, and his quest to set a world record jumping a motorcycle. This is made complicated by the fact Matt is blind. First things first: a huge thank you all of the supporters who were able to get us this far. 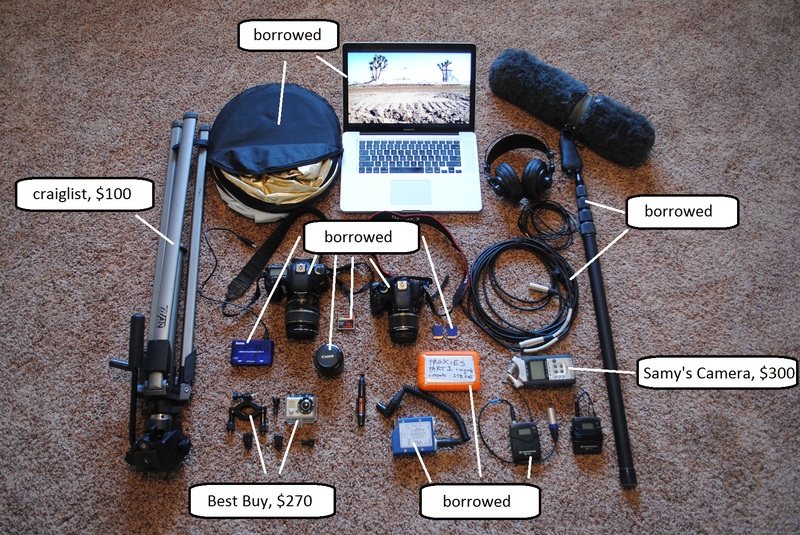 We produced that video with $5,140 in donations and a lot of borrowed gear. There are a few modest gear investments that would really help us lower the ratio of shots we totally blow. It’s real life, and it only happens once, so having stable, well-exposed shots is really important. So is good audio. And now that I think of it, we are rapidly running out of hard drive space. To that end, I have a short list of the items I think we need, that I haven’t been able to find second-hand. Anything we’re not forced to sell at the end of production will be used in future productions, training workshops, and of course lent out to other people for their movies. – Gorillapod w/ ball head: $160. Generously donated by @safesolvent! – Lacie Rugged drive, 1TB, to hold footage: $240. We will eventually need one more. – Zacuto eyepiece for the camera LCD (to expose shots correctly): $400. The rogues. – Airplane ticket to get Kai back to California from a shoot in London / Manchester. We also need to pay for unglamourous things like groceries, gas, and phone minutes, plus an air filter and oil change for that poor truck. The record attempt is scheduled for mid-December, so we’ll also need to pay a bit more rent. Once again, this documentary is entirely funded by viewers like you. If you’d like to help Part 2 see the light of day, please consider making a donation. We’re suggesting $5, which is the roughly the price of a Starbucks gingerbread latte, or three pounds of pre-mixed fajita chicken at Martinez Meats in Hesperia, California. The easiest way for you to help us finish the film and get us home for Christmas is through this PayPal button. Anything we collect beyond the cost of production will be rolled into the next project, and the next. I’ll be discussing this whole experiment at the Tyee’s viral video event on Thursday, December 1st (via webcam from England, which will be fun). If you can’t make it to Woodwards that night, your feedback is always welcome here on the blog. To learn more about Matt, or send him a message, you can visit his jump blog at www.makingthejump.com. That’s also where he’s trying to raise the money to pay for track rental and training costs, so please pass the link to people you know like the project. I hope you enjoy the rest of the film as much as we’ve enjoyed making it. Thank you for watching. I so love this video! Please use http://kickstater.com to get the rest of the funding. I bet you could do it in one day. Just post the video you already out up and send it out. This would go viral.